← The Annual Thanksgiving Three Words Video! After almost four whole years in Manhattan, I’m still crossing items off my NYC bucket list, and last night was no exception! 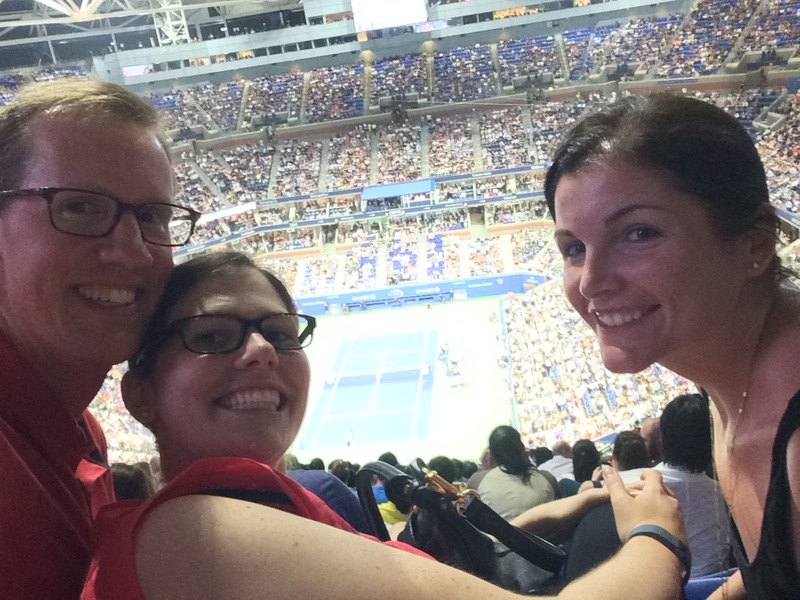 For the first time EVER, I traveled all the way to Flushing Meadows for the U.S. Open. The Unisphere? Saw it. 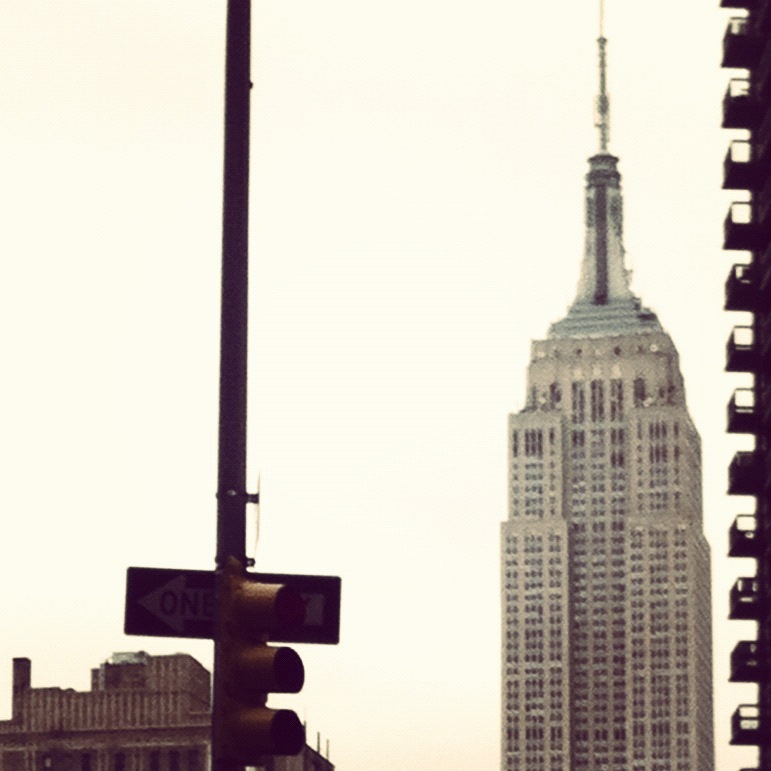 The World’s Fair observation towers? They’re there too. Also, tennis, you guys. It’s great. I consider myself an avid tennis fan, though I’ve never played an organized match and I really have no idea about the game’s strategy. But I do know things: Wimbledon is grass and all whites. Andre Agassi had a spectacular mullet. Serena is the GOAT (even if FiveThirtyEight says otherwise). And Andy Murray and Kim Sears are the Will and Kate of the tennis set. Fortunately for me, my first time at the Billie Jean King National Tennis Center and Arthur Ashe Stadium included a Murray match. Andy, one of my all-time favorite Scots, was taking on Nick Kyrgios, who decided against mocking his opponent’s bedfellows last night, but who did get warned for using obscenities. This is a classy sport, Nick. The chair umpire says “thank you” when he wants you to shut up! The tennis center and the surrounding park are magic. 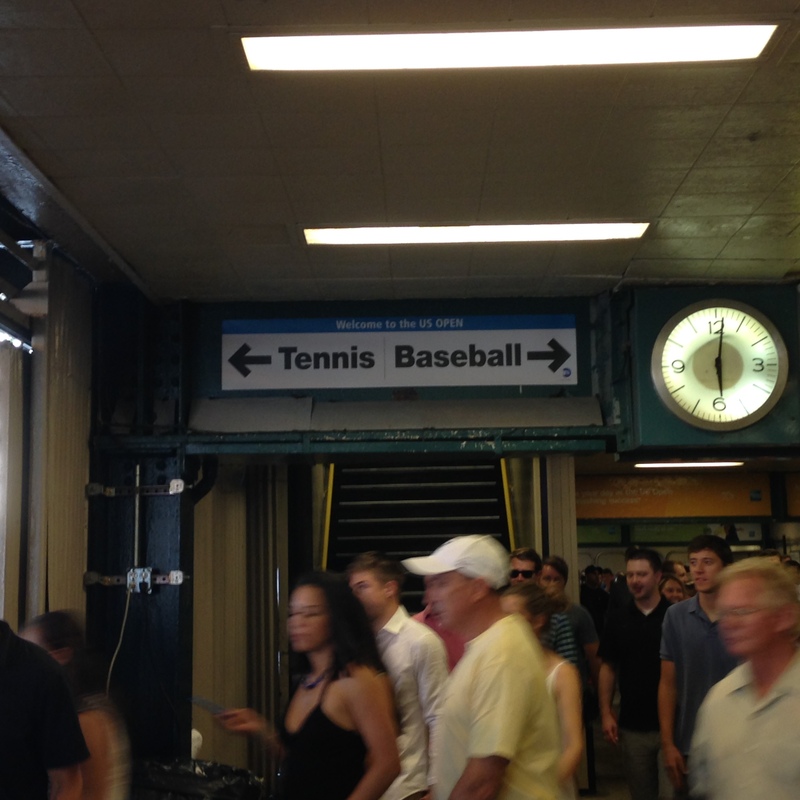 My friend (and fellow Vanderslice 617 survivor/thriver) Becca and I took the 7 train to the Mets-Willets Point stop and followed the signs for “tennis.” The signs also point the other way, to “baseball.” These are the best directions the MTA will ever give you. We walked over a very shaky, Coney Island–like boardwalk lined with flags. We passed the LIRR station, which is a few blocks closer for those of you looking for traveling tips. The boardwalk led us toward a large, circular walkaround. This is the East Gate. I wouldn’t recommend entering this way, because I didn’t and know nothing about it. Also, don’t be fooled. You’re still outside the tennis center and those are just regular people playing on the courts across from you. To get to the South Gate you have to walk pretty far from the subway stop. But it’s worth it. 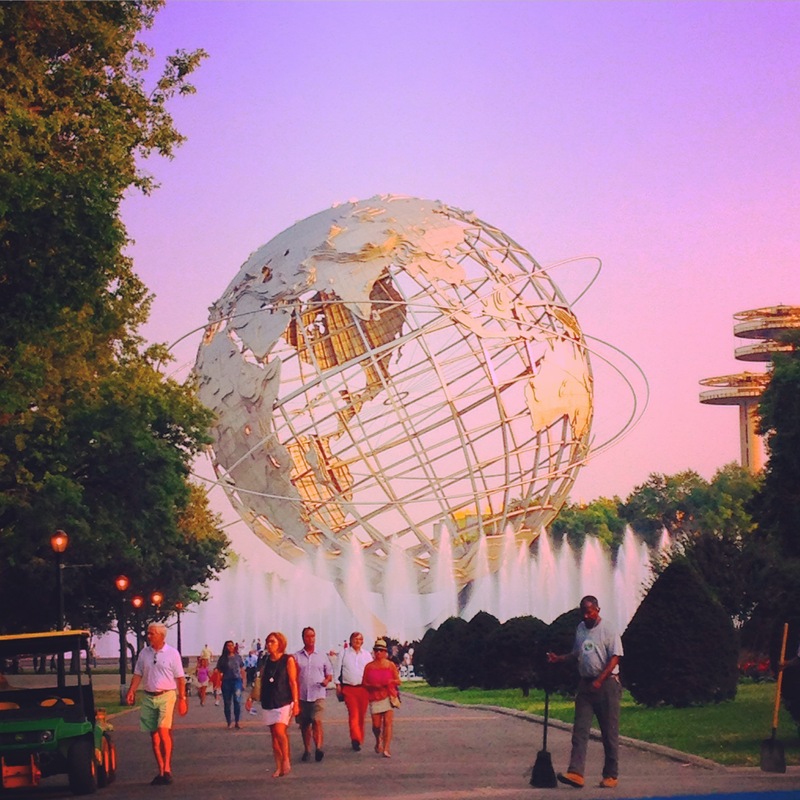 This is where you get a great glimpse of the Unisphere and its surrounding fountain. I literally said to Becca “it IS real!” We took pictures and the security guard told us to stop holding up the line. Inside the South Gate of the tennis center was a giant block party. 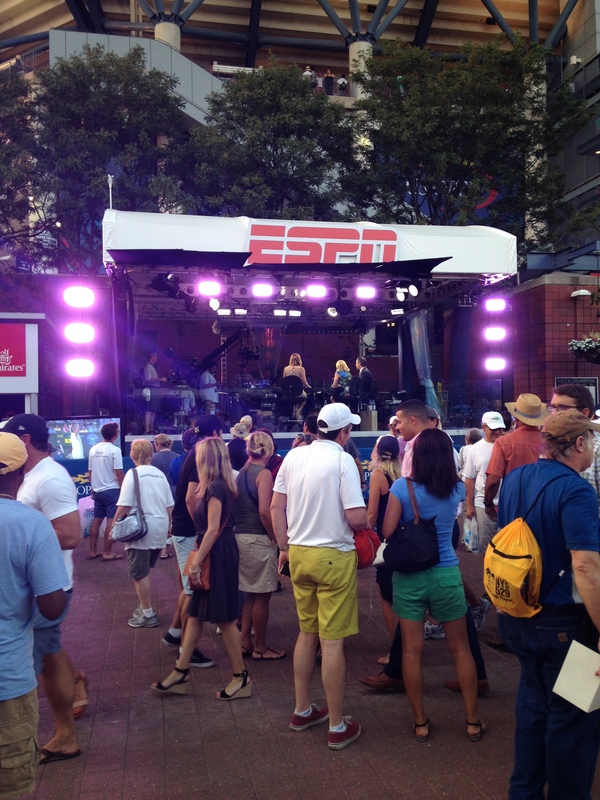 ESPN was broadcasting. Grey Goose was selling drinks. People gathered in dozens of lines for concession food that was pretty good. (Becca recommends the inappropriate foot-long frankfurter. I had a demure pretzel braid.) To the left of Arthur Ashe are several smaller courts where people can go sit in general admission seats and watch some pretty good match-ups. The courts are really nice, but are more NCAA-size than U.S. Open–size. We saw Marcos Baghdatis play before he had to retire due to an injury. Behind these courts are practice courts, where we saw John Isner, mostly because you can’t miss him. Next to these practice courts is the players’ entrance. Because Becca and I are special, we were treated to a tour of this area of the stadium—the lounge, the dining hall, the press room, the media center. I wanted to sit down at a desk and immediately start typing. I also love these kinds of tours, because you see athletes in their natural habitat, and they look perfectly normal. Except Isner. He’s still super tall. Inside the stadium, our seats were pretty high-up. But the view was excellent, and you could still hear the grunts from the court and the ball hitting the hardcourt on an ace. We could also still spot Kim Sears and her perfect hair. I actually detected her by hair only, which I think takes a particular kind of unnecessary skill. Becca and I were hoping for a shot of the Murray/Sears baby bump, but to no avail. I wondered aloud when she goes to the bathroom, since her seat was all the way in the corner of Murray’s box and I hear that pregnant people go to the bathroom a lot. I also mused about marrying a tennis player and traveling all over the world watching tennis and would I ever get sick of tennis? I should mention now that Becca’s husband, Rob, was with us, and he thought all of this was ridiculous. Flashing forward, I did not enjoy watching Kyrgios play. I know a lot of people think he’s extremely talented (which, yeah, I’d agree with that), but there was no hustle behind that athleticism. He’s super casual. He tried a standing drop shot like 10 or more times and only half of them went over the net (these stats are not reliable AT ALL). When they did go over the net, Murray was able to scrape to a lot of them, leaving Kyrgios flatfooted. And he left the court for like 8 minutes to change into a tank top. It was a lot for me. At the end of the night, Murray won in four sets and advanced. He then hit autographed tennis balls into the stands, which I thought was pretty Herculean considering he just swung a racket for three hours. It’s kind of mean that they make them do that. When we left our seats, a security guard guided us to a back stairwell, which, saying it now, seems like an order we should not have followed. We ended up out by the production trailers, which I thought was super cool and interesting (ESPN’s was the biggest production trailer I’ve seen to date), but also got us some serious side-eye. Once Rob called out that the Mets game was in the bottom of the 9th inning, we raced to the subway to avoid a double dose of sweaty crowd people. I fully admit that I had trouble keeping up with Rob, who, at about 6’7″, has some serious striding capabilities. Though I did feel the creaky boardwalk was going to finally give out on all of us, we reached the station in one piece. And, as soon as we stepped on the train, an announcer called out “Attention MTA crew: the Mets game is over. I repeat, the Mets game is over.” Made it just in time. Love this! And so good to see a blog post!